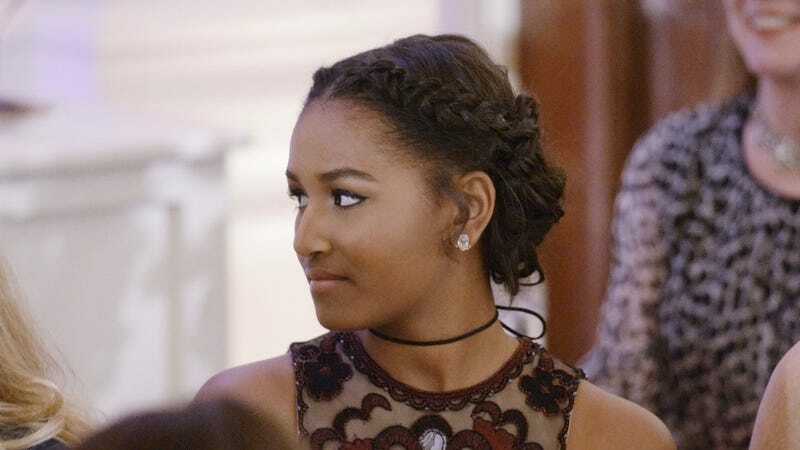 Sasha Obama attends a state dinner at the White House on March 10, 2016, in Washington, D.C. Being the daughter of the first black president of the United States comes with certain privileges, one of which appears to be getting to hang out with Cardi B at her last tour performance before the rap superstar gives birth to Cardi C (or, perhaps, Onset, if it’s a boy). Sasha Obama apparently got the opportunity to hang out with the “Bodak Yellow” rapper and her fiance backstage at Washington, D.C.’s Broccoli City Festival (which is much larger than Asparagusfest; the bathrooms smell a lot better, too). How the hell did Sasha grow up so fast? It seems like just yesterday she was the little girl cracking jokes in the White House Rose Garden, and now she looks like a Fenty model. Will Migos write a song about Sasha? After all, isn’t Natasha Obama the definition of “Bad and Boujee”? Who made the potato salad? Because this photo looks like a picture of cousins at a family reunion cookout waiting for their uncle to finish cooking the ribs. Where is Takeoff? First they left him off “Bad and Boujee,” now this! Before her appearance at Broccolifest, Cardi B announced that it would be her last tour appearance before she gives birth. In unrelated news, Donald Trump Jr. did not appear backstage at a Kanye West concert because ... you know ... Negroes were there.